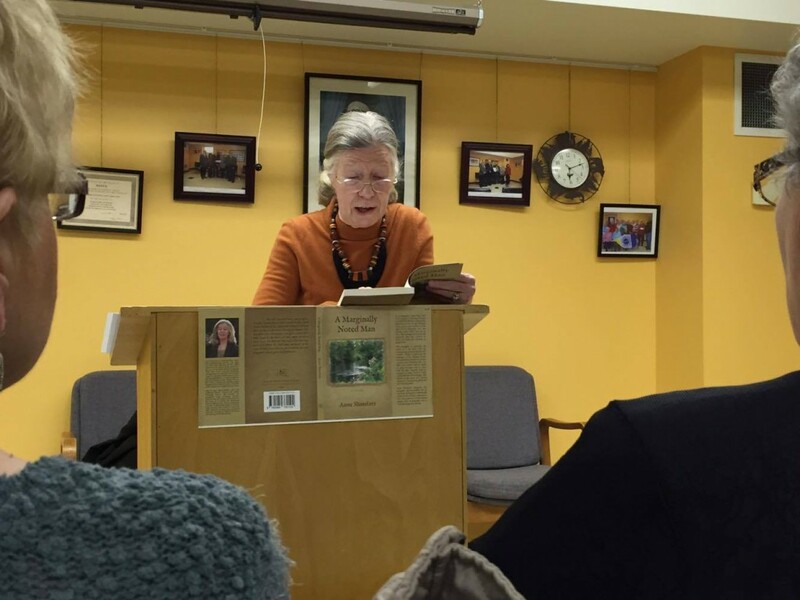 MADOC – Local author Anne Shmelzer did her first reading and signing of her debut novel, A Marginally Noted Man, Tuesday night at the Madoc Public Library. Shmelzer said she was happy to be giving her first reading in her hometown. The story, which unfolds in Hastings County, follows the life of a man named Will Nicol who is haunted by his memories of being a soldier on the Western Front in the First World War. Nicol returns to the scene of a military mission in an attempt to free his mind. Shmelzer’s book is divided into three parts: The Farm, The Monastery and The Return. Shmelzer is a retired psychiatric nurse who always had a love of writing. She wrote a memoir called The Night My Father Came Back from the War, which was published in the Ottawa Citizen. Although her new book is fiction, Shmelzer said she was influenced in writing it by the experiences of her parents. It took five years for Shmelzer to finish the book. “I kept going. I didn’t give up. You never want to give up,” she said. The hardest challenge she faced had nothing to do with the writing – it was finding a publisher. “You send the manuscript in and you don’t get a reply. Sometimes you never hear from them,” she said. But Shmelzer was not going to let that stand in her way. “You have to publish it yourself, which is what I did. I opened a company, Railway Creek Books Canada,” she said. One of her biggest goals is to get the book into public libraries throughout the region. She announced Tuesday that it has been accepted in libraries in Kingston, Belleville and Madoc. She also plans to donate a copy to the Loyalist College library. Shmelzer said British author E.M. Forster and Irish author John Banville are among the writers who inspire her. She would love to publish more books, she said. She is currently working on a story about a young woman and her child being separated at birth.